Happy Tuesday, everyone!! Here’s one of my favorite looks I wore last week (you might’ve seen me and Isla Rose doing a little jig in this Instagram post!). These jeans are one of my most recent purchases and I’m obsessed with the style and fit! 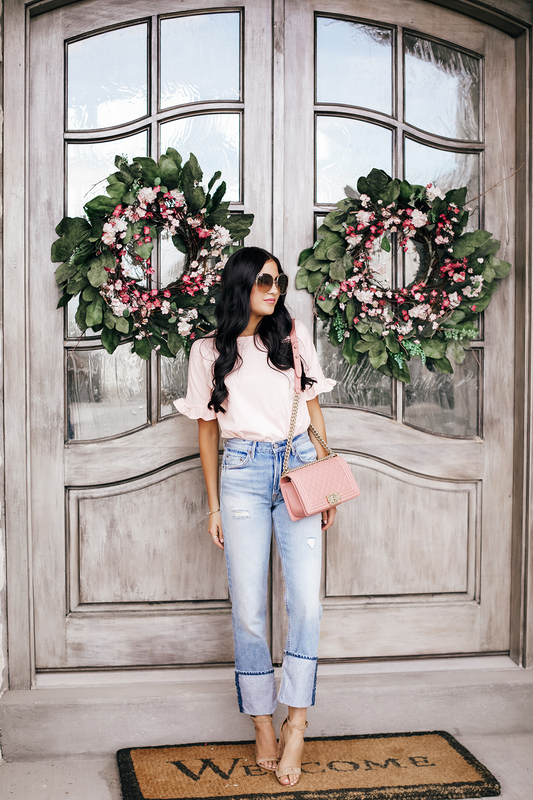 And this Rachel Parcell top launched last week in pink and sold out SO fast (one of our best-sellers to date!!!) but every now and then we get returns so it could pop back up on the site, be sure to check back. Thanks so much for stopping by, have a wonderful Tuesday! Super cool outfit, you’re looking incredible! Love your bag and jeans! Blush pink tones always suit you the best. that bag is the best, love the color. Love this. A perfect elevated comfy outfit. Your denim collection is incredible! Those jeans look super comfortable! How cute is that tee of yours! I absolutely love that top!! Those detail sleeves are so fun! This look is so chic and pretty! stunning! Everything about this look is oh so cute! I have those shoes too…aren’t they the best!? These jeans look fantastic on you! Love how you styled them. Blush pink is one of my favorite colors to wear. It’s so pretty and not overly pink. I love this top and the sleeves! Love this look so much! As much as the color of the Megan Tee is pretty, would you consider making it in a medium bright pink? I can’t speak for everyone, but muted shades don’t really suit my skin tone haha. Where are your beautiful wreaths from? Love the muted colours of this look!! So pretty! Love the doors with the wreaths! Perfect backdrop! I love this outfit so much! Those sleeves and the cuffed denim. SO CUTE! And those wreaths have me all heart eyes! Omg I’m loving this entire look, it’s so feminine and chic!!! blush pink is my FAV!!! this shirt is also totally my fav, and i was SO bummed when it and the white both sold out in my size!! it’s beyond perfect with that little sleeve ruffle!! I got them from Tai Pan Trading!! Loving the soft tones in this photo! Such cute jeans! Love the way you styled this. My birthday is 4 months away and that Chanel is at the top of my list!!! Darling this is a perfect look! 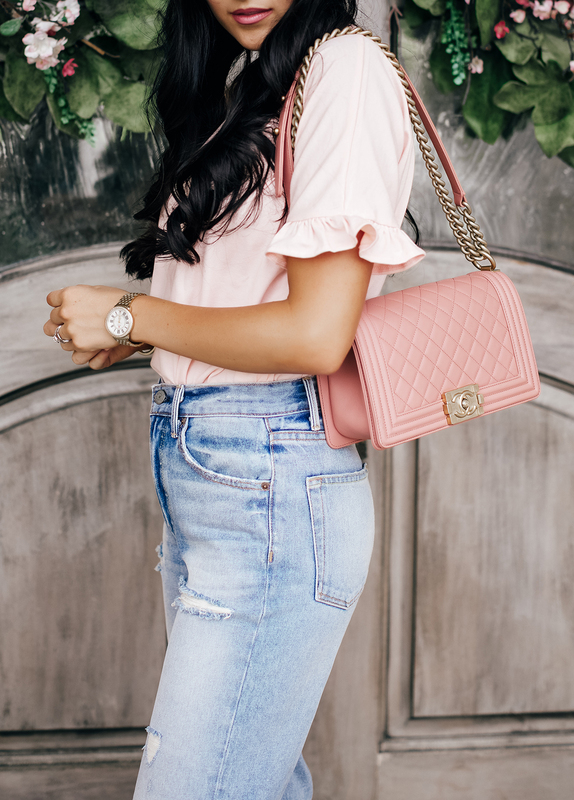 I love ?the fit of the jeans, the top , with the pink tone that ties in with your bag and shoes . Great styling! Where did you get your door wreaths? They are gorgeous! They are from Tai Pan!! I love your blog!! I was wondering if you could talk about the way you decorate for each season/holiday? I love the wreaths on your door. Any tips? 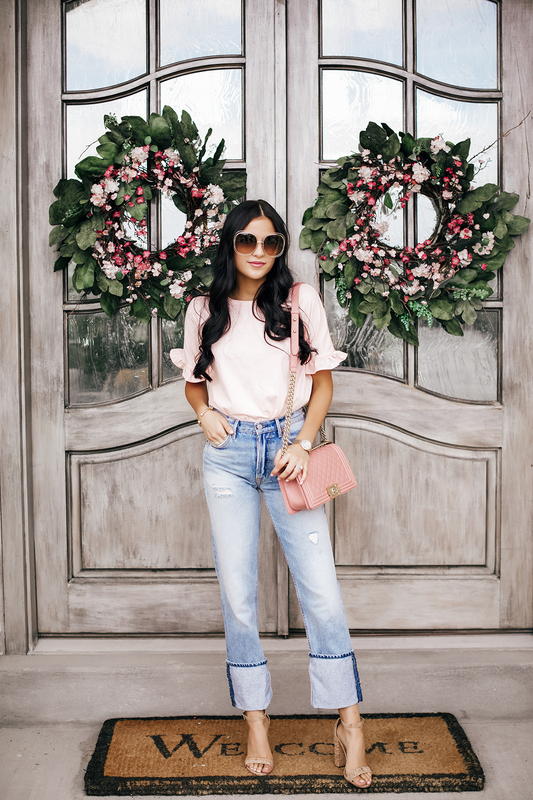 That blush tee is so fun with the ruffles on the sleeves! Loving the cuffs on the jeans too!